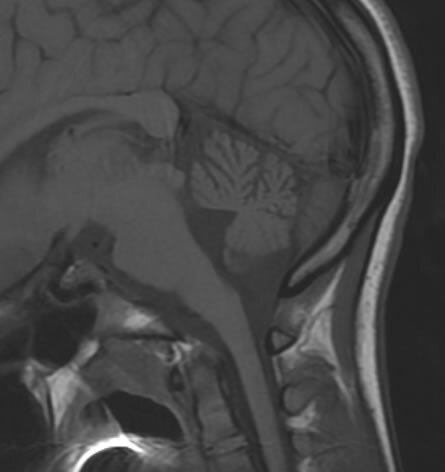 Figure 1: Sagittal MRI of person with SCA7 proven with genetic testing. There is vermal atrophy (which went unnoticed by the radiologist). 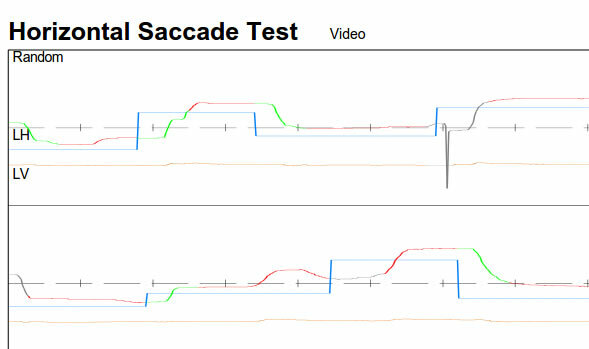 Slowed saccades in the same patient with SCA-7. There is slowing of both horizontal and vertical saccades. SCA7 is a dominantly inherited, ataxia associated with retinopathy or blindness. It is a CAG repeat disorder as are many of the spinocerebellar atrophies, as well as a few other degenerative neurological disorders. Mosely et al (1998) found SCA7 in about 5% of dominantly inherited ataxias. The figure above shows some data from a patient with SCA7. The MRI on the left shows some shrinkage of the cerebellar vermis. Interestinly, this was not noticed by the radiologist. On the right are illustrations of saccades -- eye movements used to acquire a new target. These are ordinarily very fast. In SCA-7, as shown here, they may slow down. Reduced VOR in the same patient with SCA-7. Test results suggest that only about 10% of vestibular function remains. SCA-7 is one of the few genetic disorders of the cerebellum that is associated with reduced vestibular responses. Movie of gaze and saccades in patient with sca7(4 meg). The key association to remember in SCA7 is ataxia combined with macular degeneration. There also can be very slow saccades (as shown above). Vestibular function is generally not tested in these patients. In the case illustration above, it can be seen that vestibular function is also greatly affected, although this might be in part related to "hanging up" of saccades. Perhaps if more patients were tested, more could be learned about the mechanism of this disorder. Bilateral vestibular weakness to this degree is very rare, and perhaps some of these patients have a form of SCA-7. The combination of cerebellar ataxia, macular degeneration and slow saccades is rarely reported in the literature. Jager (Jager, von Rosen, Fesl, & Gasser, 2000)reported a few cases in SCA7. A family was reported by Anttinen et al (Anttinen et al., 1986), simply called OPCA. SCA7 was reported in this situation by Modi in 3 black South African families (Modi, Modi, Martinus, Rodda, & Saffer, 2000). There are a number of other reports of macular degeneration and ataxia (Gouw, Digre, Harris, Haines, & Ptacek, 1994).